Apartment charming. Light, silent and very widely. 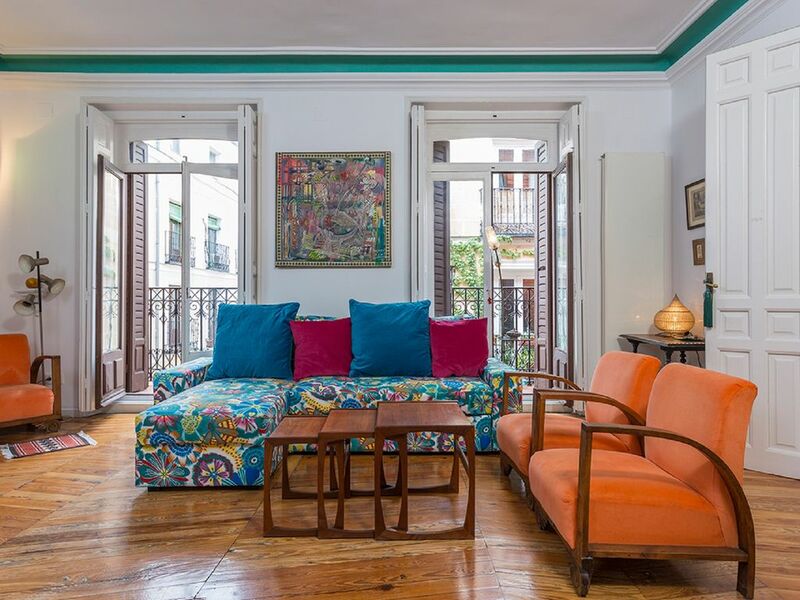 quiet 5 minutes walk from the Plaza Mayor, Sol, Santa Ana, El Retiro, Museo del Prado street. Fit 6 people comfortably. Jacuzzi, WIFI, very equipped, PARKING at 4 min walking. You're going to love it. They have a style facade "neomudejar" typical of the city of Madrid. The staircase is restored and has lots of charm. The floor is beautiful, has a marble fireplace and decor this very carefully. The kitchen is very well equipped. All spaces are large and generous. The master bathroom has a jacuzzi. The area is perfect to plunge and discover Madrid, Madrid authentic and friendly. The neighborhood is completely safe. BEDROOM 1. It has a double bed 150 cm. The bathroom is built like a hotel suite. BATHROOM 1: large with bidet and jacuzzi. BEDROOM 2: has a balcony to the street, two beds 90. SALON: spacious and bright with two balconies overlooking the street. Chimney. Kitchen / dining room: fully equipped with oven, microwave, refrigerator ,, washing machine, dishwasher, utensils, etc. Apartamento hermoso decorado y cómodo. Excelente ubicación, en un barrio animado, para explorar Madrid y con mucho opciones gastronómicas en la proximidad. El proprietario es muy attente y communicativo. We stayed in Santiago's apartment in January and had a great experience. The apartment is big enough for 4 adults to be very comfortable. The neighborhood is perfectly situated. We walked everywhere! Go right across the street to El Sur Tapas Bar and order canya or vinto tinto at the bar. Put your name on the list for a table in the back. Service is great and food terrific. Our favorite plaza was Plaza Santa Ana. Great restaurants on the surrounding streets and minutes from the apartment. The Sofia Museum is just blocks away and you can see Picasso's painting, Guerncia! Santiago was helpful and prompt to answer questions. He returned our deposit before we arrived back home to the States. Thank you Santiago. This apartment was the 5th of 5 different VRBO we stayed in within the course of 30days travel throughout Europe. By far, it was the best. It is clear that Santiago cares about the experience he creates for his guests. The restaurants and bars recommendation was spot on! The apartment was spacious, very clean, comfortable and offered all the amenities needed for an excellent experience. We felt treated as friends and not renters. Santiago even went the extra mile and helped us find an awesome babysitter while we were there. Thank you for your hospitality and we look forward to visiting again in a near future. The apartment was roomy and inviting, with a location near major art museums and other points of interest. Santiago was extremely helpful in making our stay an enjoyable one - from recommending restaurants and nearby grocery stores, to calling us a taxi for the next leg of our journey. Santiago met us in the evening when our incoming flight was delayed. Very kind and helpful. This flat was located in an artsy area & near places that will meet all your needs. Some people might think the street too noisy, but not for us. The El Sur Bar across has the most interesting and delicious dishes. Don't forget to make that your first eating stop. It does lack an elevator, so taking heavy luggage up to the second floor was a challenge. Those are just the little things to ignore since the place is sweet. perfect area to explore Madrid. The center. Walk 5 minutes to reach the Plaza Mayor, Puerta del Sol, Museo del Prado, Atocha train station, Reina Sofia Museum. The neighborhood is full of life, shops, markets, bars exquisite tapas, typical restaurants and other innovators. The area is totally safe but with lots of personality. You're going to love it.